Welcome to Freebie Friday! Today I will be doing my first giveaway! 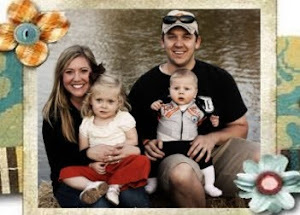 Due to a challenge from my husband, I will be blogging every day for a month straight. This month we will be doing a giveaway each Friday. So check back daily or at least weekly. 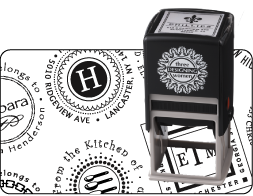 Drum Roll Please..... today we will giving away a gift certificate for a Three Designing Women Custom Stamp. It is valued at $48. Courtesy of Chic Giving. You can go to the Chic Giving site for a preview of some of the stamps. You will choose the style and personalize it with your information. Make it for yourself or give it as a gift. These make wonderful Birthday and Mother's Day gifts. Leave a comment (only one entry per person). Please tell me about your favorite gift. (One that you have received...) Please include your e-mail address if you are not a blogger member.. so I have a way of contacting you. Please send this to your friends, post this on your blog, Facebook or Twitter. Please let me know (in your comment) if you post it on another site and I will give you another entry for each place you post it. This giveaway will be open until Monday morning (April 6th) @ 10am. The winner will be selected using a random number generator and will be announced on Monday. P.S... my baby girl is 11 months old today... countdown to age "one" and the big party has begun. Wow, these past 11 months have flown by! This January my fiance and I visited my family in Arkansas. My grandfather usually writes me a check for Christmas. I noticed it had both our names on it. Then I noticed an extra zero! He would not take it back either. Special, generous, man of God. How fun!!! I have thought about ordering one of those stamps for a while!!! I can't believe Kate is 11 months old! YIKES! Where has the time gone!!! A favorite gift that I have received...well, my very favorite gift is Jack and the fact that God helped him (and us) through everything he went through when he was born. The best gift I have received recently was a cute tote bag from my hubby. On girls trips I would always use one of his camo bags, which were not cute! I never complained or mentioned that I would like a bag of my own. I love that he decided for me that I needed a cute one! Wahoo free stuff :)! The best gift I ever got besides that little monkey sleeping on the couch right now? Would have to be this heart pendant from my hubby. He is not a big "gifts" person and it was one of those totally unexpected Christmas gift and it was jewelry, what more could a girl ask for?? You are so clever Nicole! I want to go on record as being you biggest non-family member fan! One of the best gifts I ever received was a real live bunny rabbit. I still have her and she makes a great pet. So cute! Hey Nicole! I love reading your posts and looking at the wonderful pics of Kate!! I guess my favorite gift would have to be the Mother's devotional Bible that my mom gave a me a couple years back for Christmas. I love it and all the devotions in it are from mom's so it is great. Hey Nicole, the stamp looks cool. I love freebies! My favorite gift was a handmade card from our daughter Ashley. Inside it had a poem written by her to me for Mother's Day. Sometimes it really is the little things in life that are special. Hi Nicole! My favorite gift would have to be my deluxe automatic barbie car that I got for Christmas when I was 6! I was the coolest gal on the block driving that thing around! Hey Nicole- The best gift I have received would have to be the "gift of righteousness" that was given to me from my Lord and Savior. "For if, by the trespass of the one man, death reigned through that one man, how much more will those who receive God's abundant provision of grace and of the gift of righteousness reign in life through the one man, Jesus Christ." My husband sent me to the Nordstrom spa for the whole deal. It's been ten years but it was just such a treat and so unexpected. I can't believe your daughter is about to be one! How fun!!!! My favorite gift is an old skeleton key that my husband gave me on our wedding day with a note that said "your are the key to my happiness"...that being said, I have wanted one of these stampers for years! I have to say the best gift was a cedar chest from my family for Christmas. I always wanted one and they handed me a box on Christmas morning with three potatoes wrapped in inside and a note that read "This is just small potatoes, your real gift is in the garage".